After the Industrial Revolution, mass production of goods led to mass consumption in a necessary way. With factory made goods now accessible and affordable across the country and around the world, the quality of life vastly improved for countless people, elevating our agrarian culture to a global commercial one. In the modern world, there is room for both factory made and handmade, where artisanal can live beside industrial. Check out the differences between the two approaches below. Though handmade might seem always like the better bet, cost is a major factor in modern consumption. The cost of crafting all the elements that go into modern life is impossible—not at the scale modern society demands. A 20 to 24 piece set of handcrafted silverware costs approximately $426, whereas a factory made set costs only $20. Similarly, handmade plates can run $40 per plate, or $3.50 when purchased at a mass-marketed store. At that price, you can afford to break a few without worry of breaking the bank for a replacement. Besides being cost-effective, factory made items are also time-effective. While the high quality of proper craftsmanship cannot be discounted, one cannot ignore the length of time it takes for one person to personally make an item. For example, it would take a skilled seamstress or tailor using an old-fashioned hand loom approximately five-and-a-half hours to make a pair of jeans. Considering that 520 million pairs of jeans are sold each year—in the US alone—it would take 1,000 seamstresses and tailors, working 12 hours a day for 365 days each year, for 652 years, to equal the factory output of one year of jeans. Factory made mass production does not just affect the time it takes to create something, but also to maximize the time allotted to produce. For instance, the harvest window for corn in the US is roughly 60 days. Currently, it takes about 290 man-hours to harvest and shuck 1 hectare of corn by hand. (1 hectare is equal to 2.47 acres.) That doesn’t seem so impossible… until you consider that there are 39 million hectares of corn grown in the US each year. Corn is a foundational ingredient in not only our food processing but also in our livestock feed, and is an agricultural keystone in our economy. To harvest what is necessary to keep the corn industry sustainable would simply not be possible without the heavy lifting of machinery and automation. The good news is we don’t have to choose between the two approaches. There is room in our world for both the necessity of factory made items and the artisanal craftsmanship of handmade items. Being selective about where our time, money, and energy is channeled can help both sides of the production industry thrive together. Products advertised on brand and retail websites including: Express, Amara, Overstock, Zappos, Barneys, Food52, World Market, Target, Walmart, Williams Sonoma, Etsy, Kitchen Collection, JR Cigars, Thompson Cigar, Toyota, Lichty Guitars, Guitar Center, Denims and Jeans, and Dreyfuss and Co. So many things in life have become more efficient thanks to more automated technology. Take word processing, for instance, and just think of how much faster it is to type a letter on computer rather than hand write it out the old fashioned way. Think of how much faster and more efficient it is to send an e-mail than to mail one via the postal service. These increased efficiencies can't be disputed - and these increased efficiencies don't just impact our daily personal lives, but industry as well. Case in point (no pun intended) is when it comes to case packing - there's the manual way of doing it and the automatic way of doing it. Case packing is essentially the process of placing packaged product into corrugated cases so that they can be transported to the end user or stores for placement. We probably don't need to tell you how much faster it is to purchase automated equipment for your facility to carry out this work. This post will take a closer look at automated case packing equipment, the types of equipment and just what they can do to increase your efficiency and take your business to that next level. • Feeling the pinch of higher labor costs and bringing in technology to help curb this. And yes, while purchasing this type of equipment comes with a high cost, most companies can recoup these upfront costs in a matter of months due to the increase in efficiency. • The desire to create a safer, more sustainable working environment - as automated packing equipment enhances safety in the workplace and also helps minimize scrap and waste. • Top load case packers: Fitting to the name, top load case packers load items through the top of an RSC, or regular slotted carton, wraparound or other sort of case. Many top load case packers have multiple stops throughout the line, allowing packagers to fill multiple layers or types of products at various load stations. Most top load case packers are all-in-one machines that also have small footprints. Many even seal the cases with either glue or tape so that they're ready to leave the factory floor upon completion. • Side load case packers: Just as how top load case packers load product into RSCs from the top, side load case packers load product in from the side. Side load case packers are ideal for confectionary, food and beverage, personal care, nutritional and pharmaceutical products, among others. Like top load case packers, side load machines also often seal the case by gluing or taping the RSCs after they've been filled. Side load case packers may also be referred to as end load packers, as some models fill product into the RSC through the end. • Robotic case packers: In terms of footprint, robotic case packers take up the smallest overall space on the plant floor. These types of case packers are also ideal for plants that want to maximize changeovers and flexibility. 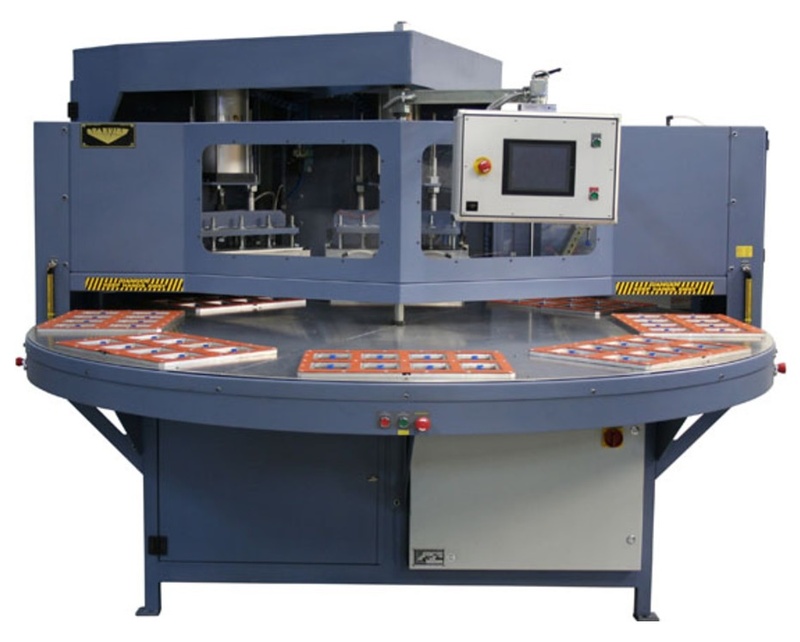 • Wraparound case packers: These machines pack product from either the side or the top of the wraparound. Like robotic packers, wraparound packers usually utilize minimal space on the plant floor. These types of packers also typically are more affordable to run, as they minimize the cost of corrugated material. Cost per unit is also normally decreased and wraparound packers offer better consistency and efficiency when it comes to palletizing. Aside from the aforementioned four types of case packers, it's worth noting that there are also optional add-on accessories that can be installed on the equipment to make them even more efficient on the factory floor. As we've mentioned regularly throughout this piece, the big benefit of automated case packing is the streamlining in efficiency of packing operations. As productivity increases, the time and labor decreases, which becomes a win-win for a plant manager. Automated case packing equipment is able to perform more repetitions in less time than it would take to do manually, and because of the streamline in efficiency, changeovers are short, there's less room for error and less waste generated as a result. What's more is that while automated case packing equipment is expensive, most plants can recoup the upfront costs in less than six months after installation due to the increase in efficiency and productivity. While case packing machines vary in efficiency by model and style, it's not uncommon for most top load case packers to be able to handle about 10 cpm or 20 picks per minute. Side load case packers range from about 10 cases per minute to in the neighborhood of 85 cases or trays per minute. Robotic case packers are said to be the most efficient case packing device, as most have the ability to process about 100 or so packages or cases per minute. These numbers are far more efficient than what it would take to complete these operations manually - and this is even more so the case when you consider the optional add-ons that are able to make these automated case packers even more efficient. While automated case packers have a place in terms of increasing efficiency when it comes to facility operations, it's also worth noting that these machines are expensive and can range anywhere from a few thousand dollars to hundreds of thousands of dollars in cost. While the payoff and ROI of bringing these machines in house is evident, these upfront costs may be a little too much for many businesses. That's where a quality, previously owned machine can come in handy - as you can acquire a quality machine and begin to immediately reap the benefits of such, for a used price. For more information on automated case packing equipment, and to browse our selection of previously owned equipment, contact Bid on Equipment today. If you head to the grocery store, you'll find a bevy of different packages. Typically, these packages are divvied up into two main categories - rigid packaging and flexible packaging. While everyone seems to have their own definition of what's considered "flexible" when it comes to packaging, generally speaking flexible packages are considered to be the plastic pouches and bags that hold products like salad, shredded cheese, snack foods, juice boxes and certain frozen items. Rigid packaging, on the other hand, is considered to be the boxes and thermoformed plastic containers that help package everything from health and beauty products to food and drinks. Clam shell packaging usually falls into the rigid packaging category, as it is usually made from either rigid plastic or paperboard. When it's created from plastic, it's usually either thermoformed or injection molded. So just what is clam shell packaging? Specifically, it's a one-piece container, typically but not exclusively made of thermoformed or injection molded plastic, that has two halves which are folded together to protect and package a product. It utilizes a hinge of sorts to complete the open and closing action. It gets its name because it looks and operates similar to that of a clam shell - and you may be surprised at just how often you see and use clam shell packaging in your life. For instance, think of the to-go box that you get from your favorite restaurant when you're taking the rest of your meal home as leftovers - chances are the foam or paper box is a clam shell package. When you order a burger at a fast food joint, the burger may be prepared and presented to you for consumption in a clam shell box. If you buy a bunch of nails at the hardware store, they may come in a clam shell package. And when you purchase things like fresh fruit and produce at the grocery store, it's not uncommon to find things like blueberries, raspberries and strawberries packaged in plastic clam shell containers. Many other markets and industries rely on clam shell packaging, which we'll get into more throughout this piece. • Attractive: Aside from protecting the product that it is packaging, one of the key roles of packaging is "popping" so that it stands out on the shelf and appeals to consumers. Clam shell packaging accomplishes this in a few ways. For starters, many clam shell plastic packages allow the customer to see inside the package and observe the product, and consumers prefer this transparency feature. There's also the ability to further customize and enhance the package design by inserting special graphics cards and labels into the package. It's also possible to dye the plastic to a different, more eye-popping color. Bottom line - clam shell packaging may seem simplistic in nature, but there's a lot that can be done to make it more appealing to consumers. And when part of a package's job is to appeal to consumers, this benefit is crucial. • Good protection: Clam shell packaging also offers good product protection, a trait that has led many brands and consumer product companies to package higher-end items in them. Clam shell packages can usually be sealed or secured in some way, which helps keep products safe in the transportation of them, and many clam shell packages are also designed to prevent tampering. • Variety: As we hinted in the opening, there are a lot of different types of clam shell packaging. We'll get into more of this variety in the next section, but know that clam shell packaging can be created around the application - and not the other way around. This helps brands put products in the packaging that is best for them. In a sense, clam shell packaging can be packaging without compromise. • Custom vs. Stock: Many manufacturers offer clam shell packaging either by custom package design and creation or in stock options. While stock options are cheaper than clam shells that are custom made, they may not secure and package the product as well as the alternative. Noting this, it's important for companies to weigh the pros and cons of the custom vs. stock option before making a decision. • Box: Fitting to the name, box-like clam shell packages are box-shaped. Typically made of plastic, these packages can be used to package everything from fresh fruits to nails from the local hardware store. Large box clam shells are often used as to-go or carryout containers at restaurants. • Rectangular: These types of clam shells area ideal for packaging more unconventionally shaped products. They can also be useful for packaging food items, such as cookies. • Circular: Circular clam shells are best utilized for single-serve items, like sandwiches at a local deli. These types of clam shell packages often seal in some way to protect the food from premature spoilage and serve as a tamper resistance. What Industries/Markets Use Clam Shell Packaging? One of the other big notables when it comes to clam shell packaging is that it isn't going anywhere. We already noted that clam shell packaging accounts for about 65 percent of the packaging market when it comes to produce - and this number is expected to increase about 20 percent by 2019 according to estimates from Freedonia Group, a leading market research firm. In other words, clam shell packaging is here to stay - and it's only likely to become more popular in the years to come. For more information on clam shell packaging, and to learn more about the technologies and methods that help create this style of packaging, contact Bid on Equipment today.